WCED Panel. What's Up with Authoritarian Elections? Erica Frantz is an assistant professor of political science at Michigan State University. She specializes in authoritarian politics, democratization, conflict, and development. She has published six books on dictatorships and development, the most recent of which is “Authoritarianism: What Everyone Needs to Know” (Oxford University Press). Allen Hicken is a professor of political science at the University of Michigan. He studies political institutions and political economy in developing countries with a primary focus on political parties and party systems in developing democracies and their role in policy making. His regional specialty is Southeast Asia where he has worked in Thailand, the Philippines, and Cambodia. He is the author of “Building Party Systems in Developing Democracies,” published by Cambridge University Press in 2009. Carl Henrik Knutsen is a professor of political science at the University of Oslo (UiO) and Research Group Leader for the Comparative Institutions and Regimes (CIR) group at the same department. He also holds a secondary position as Senior Researcher at the Peace Research Institute Oslo (PRIO), is co-PI of Varieties of Democracy (V-Dem), and is a member of the Norwegian Young Academy. He defended his PhD, "The Economic Effects of Democracy and Dictatorship," at the University of Oslo in 2011. Knutsen's research concerns, for example, the economic effects of political institutions, democracy measurement, and the determinants of autocratic breakdown and democratization. Alberto Simpser is an associate professor of political science at ITAM in Mexico City. He is the author of “Why Governments and Parties Manipulate Elections” (Cambridge University Press 2013), coeditor (with Tom Ginsburg) of “Constitutions in Authoritarian Regimes” (Cambridge University Press 2014), and has published articles in the “American Journal of Political Science,” “Journal of Politics,” “Public Opinion Quarterly,” “Latin American Research Review,” and “Annual Review of Political Science,” among others. He has a PhD in political science from Stanford University. His research interests include the political economy of development, democracy, election fraud, corruption, political culture, and political methodology. Prior to joining ITAM in 2014 he served on the faculty of the University of Chicago’s political science department as assistant professor. Organized by the Weiser Center for Emerging Democracies with support from the Center for Political Studies (U-M) and Japan Society for the Promotion of Science. If you are a person with a disability who requires an accommodation to attend this event, please reach out to weisercenter@umich.edu at least 2 weeks in advance of this event. Please be aware that advance notice is necessary as some accommodations may require more time for the university to arrange. 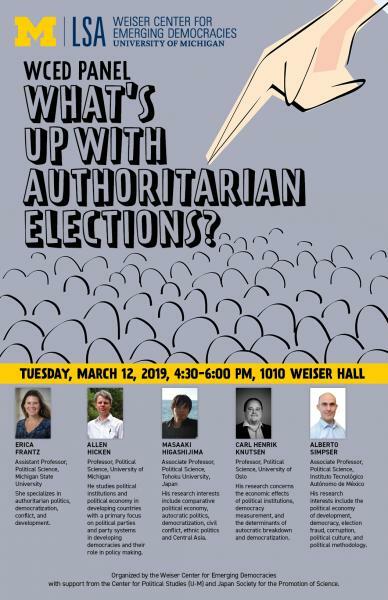 The Weiser Center for Emerging Democracies organizes a number of public events each year such as lectures, conferences, and films, many in collaboration with other U-M units. Please use our searchable events calendar for information about upcoming programs sponsored by WCED. To see all events organized by WCED and other affiliates of the Weiser Center for Europe and Eurasia this semester, click the image to the right for a PDF calendar.